Aventurine is an opaque variety of quartz with chemical formula SiO2. It can also contain some amounts of plagioclase Feldspar in its matrix. 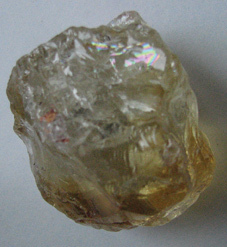 Its hardness is between 6.5 and 7, which is the average range for a silicate material. Its most notable property is aventurescence, a sparkling display of colors, that occurs as a result of the presence of tiny mineral inclusions (mica or hematite) on its surface. The color of Aventurine can be green, brown, orange, yellow, blue, and red. Most common is the green variation, and here we are going to consider this one only. Notable occurrences of Aventurine are in Brazil, Chile, Tibet, Nepal, Spain, India, Russia, and Austria. 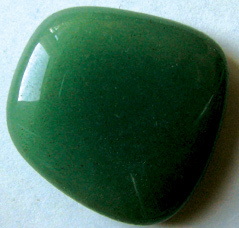 Aventurine is considered a stone of prosperity. It brings to the wearer a sense of power, because it helps attract power, wealth, and abundance. This stone is considered helpful in any decision making situation. The name of Aventurine originates from the Italian word avventurino, which means “by chance”. It refers to the 18th century chance discovery of aventurine glass or goldstone. Green Aventurine is not listed on the traditional birthstone chart. It doesn’t belong to the modern birthstone chart either. Nevertheless we can make a couple of associations with some Zodiac signs. Given its color, however, Aventurine belongs to the group of natural birthstones of people born between April 20th and May 20th (Taurus). Being associated with Venus, which is the ruling planet of Taurus, Aventurine is a planetary stone of Taurus. With its pleasant green color it is believed to bring good health, success, and rejuvenation. People born under the sign of Taurus are naturally inclined to accumulate wealth, thus Aventurine is perfect for them. Simultaneously, Green Aventurine can help relieve the stresses and mental and emotional pressure of these hard working individuals. In that sense, Aventurine is a great stone for anyone who is trying hard to pursue their goals. Some people relate Aventurine with the Zodiac sign of Virgo (August 23 to September 22), while others with the sign of Libra which follows Virgo (September 23 to October 22). In the Ayurvedic (Hindu) astrology, Green Aventurine is a Libra birthstone. It can help the Libra individuals to enhance their will power and keep negative emotions under control. As Libras are often very indecisive in their actions, Green Aventurine can instill some definite sense of purpose in them. In the Mystical birthstone chart, Aventurine is a mystical birthstone of the Zodiac sign of Cancer. The ability of this stone to drive out fear and anxiety is what makes it so suitable for people born in this sign, who are usually very susceptible and sensitive. Aventurine has been used as a universal healer, capable of reducing stress, improving prosperity, and developing confidence. Ancient peoples have been using it because of its capacity to calm the mind and promote peace of mind. 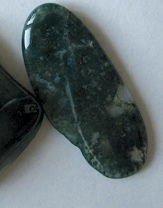 Tibetans used Aventurine as a decorative stone, and believed that wearing Aventurine can improve creativity. Aventurine has a reputation of being a good luck charm that brings prosperity and abundance. 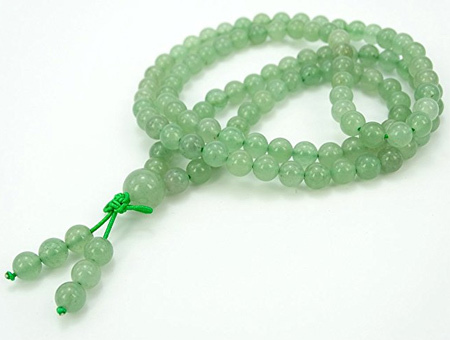 Therefore lucky talismans made out of Aventurine are very popular for gamblers, in lottery, and any other prize-winning games. Another use of Green Aventurine is believed to be a lucky charm for boosting fertility. 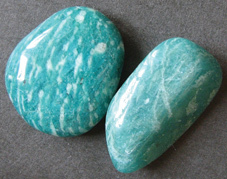 Aventurine is used in crystal therapy as a universal healing stone. In healing, the green variation of Aventurine is the most popular. The reason is simple. Green color is the most healing of all colors, especially with regard to physical healing. Aventurine, being a stone from the family of silicates ( Quartz), has a special ability to help remove internal blockades from the body. As a stone of the heart, Aventurine works on releasing emotional pain, stress, and inner pressure. It has a positive effect on the emotions, helping reduce fear, anger, anxiety, and irritability. It strengthens the energies of the heart chakra and protects this essential energy center of the body. If you decide to choose Aventurine as a personal birthstone, you have two choices: either find suitable jewelry with embedded Green Aventurine, or use loose stones. It is easy to find beautiful lose tumbled stones that you can easily cleanse, charge, and program to suit your needs. Cleanse your Aventurine gems by using running water. Charge them in the morning sun.